The 5th round the 2018 Chess Olympiad saw PNG narrowly lose 2.5-1.5 to Mauritius. We were seeded slightly ahead of them, but their lower board players looked to be in quite good form. In the end we were both luck and unlucky, with Tom McCoy missing a win on board 4, while I came back from the dead to grab a point on board 2. Despite the loss, we are on 8 game points (but only 2 match points) which is a reasonable score for us. One of the positive side effects of this is that we tend to have slightly easier pairings within our score group, although even at the lower end of the tournament, no pairing is truly easy. In the Open section there are still 4 teams with 5 wins from 5 games. Azerbaijan had a narrow win over Armenia to keep their lead on tie-break, but they share the spotlight with Czech Republic, Poland, and The Ukraine. Australia had win over Faeroe Islands, and now are tied for 25th place. In the Women's event, the Australian team suffered their first loss of the tournament against the Czech Republic, but their 23rd place is still impressive. Today is the tournament rest day, allowing people to both recover from last nights Bermuda party, as well as to attend meeting. I am currently sitting in a conference on Governance Standards in Sport, which has attracted a small but interested group. Up until now I haven't been following the top boards too closely, but the sensation of round 4 was Poland's win over Russia. This once again leaves Russia with a lot of work to do, especially if they want to win the Olympiad for the first time in 16 years. There are still a number of teams at the top, but the most interesting pairing of the day could well be Azerbaijan against Armenia. The Australian Open team is battling out in he upper half of the standings, drawing 2-2 against one of the Gerogian teams yesterday. The Australian Women's team is doing even better, currently in 7th place after 4 rounds. They have won 3 of their 4 matches, and have drawn the other one. They play the Czech Republic today, and given the closeness in seedings for both team, they could go into the rest day among the leading group. Day 3 of the 2018 Chess Olympiad saw PNG go down 1-3 to Ghana. We lost games on the top 2 boards and drew 3&4. My game started off well when I managed to win a pawn in the opening, but as usual lost control of the position, and then missed tactics in time trouble. We were slightly better in the remaining two games, but were unable to convert them into full points. As for the Olympiad itself, it is a bit of a mixed bag. As with recent editions, the security and control of spectators is somewhat heavy handed. Getting into the venue is difficult due to security checks, and even with my media pass, finding the media room took me 2 whole days! The hotel that we (and a number of lower ranked teams) are staying at is nice and relaxed, but located about 20km's from the venue. This would normally make it difficult for us, but the PNG team has hired a menacing looking black Mercedes, so we tend to travel in style! Today PNG play Timor Leste towards the back of the tournament hall, and hopefully we can score our first match win of the tournament. The second round of the 2018 Olympiad was actually quite a good one for the Papua New Guinea team. Usually it takes 3 or 4 rounds before we look like picking up a match win, but a narrow 1.5-2.5 loss to Liechtenstein was a pretty good outcome. The credit for this has to go to team captain GM Elshan Moradiabadi, who provided excellent opening preparation for the team. We all got positions on the board that we expected, and for a couple of us this was translated into a result. Stuart Fancy won a nice attacking game on Board 1, while Rupert Jones had a 'gentlemens' draw on board 4 (against former FIDE Treasurer Willy Iclicki). I failed to grovel a draw in an ending where I was being squeezed, but a number of people pointed out I probably could have saved it at the end. Helmut Marko had a good position out of the opening, but he dropped a pawn and could not save the game. In round 3 we are playing Ghana, although my own game is already finished. After winning a pawn in the opening I played the rest of the game poorly and lost. Curiously my opponent who is running a version of Street Chess in Ghana, and he even wore a shirt with 'Street Chess Champ' printed on the front! At the moment we are down 2 games, but look better in the other 2. The best result is a 2-2, while I don't believe we will do worse the 1-3. The first day of the 2018 Chess Olympiad is of course, an exercise in controlled chaos. It is a given that the round will start late, so I was impressed that it started at 3:15, only 15 minutes after the published start time. There was the usual scrum at the security checks and some teams were still outside when the clocks started (most notably the USA) but even they did not lose, as the default time is a slightly better 15 minutes (rather than 0). The PNG team played reasonably well against an IM strength Belgium team, but one by one we went down. I was probably lost earlier than my team mates (having forgotten my prep as early as move 5), but managed to hang on until just before the first time control. Tom McCoy had a good Olympiad debut, taking it up to his opponent, but in the end the rating gap counted for something. Today PNG play Lichtenstein, which isn't a bad pairing for us. Although we are outrated across the boards, it isn't by a hug amount, and hopefully we can get something from the match. Australia starts of against Qatar, while NZ play the Seychelles. In the Womens event Australia begin their campaign against UAE, while NZ is playing India on board 5. In other Olympiad news, the PNG team ended up in its original accommodation, rather than being upgraded to the Hilton.This may not be a bad thing as where we are staying is quite nice and relaxing, despite being some distance from the venue. Other teams were given hotels a lot closer, but apparently the quality of some of these isn't that great. Last nights opening ceremony was one of the best I have seen, and the players I spoke to agreed. The musical numbers were very good, with lots of visual affects and fire works. The speeches were generally short and to the point, although a bit of campaigning from the FIDE establishment did creep in. First round begins at 3pm local tome, which I believe is 9pm Canberra time. The start may be delayed slightly, if only because the first round is also a bit chaotic. It is early morning in Georgia as I type this, and I'm glad a woke up before sunrise. As with most Olympiads, the days before it starts can best be described as semi-controlled confusion. Having been given a hotel some way out of town, a last minute email indicates the PNG team may be staying in Batumi city instead. This means that someone really likes us (giving us a central location) or wants us away from more impressionable teams (as we can be troublemakers at times). Of course, I will only know for sure when we get to Batumi. At the moment parts of the PNG and Australian teams are in Tbilisi, and will be heading to Batumi by train this morning. The opening ceremony is this evening (23rd September) with round 1 starting tomorrow. While it is still be confirmed, I may end up taking board 1 for PNG in the first round (with Stuart Fancy resting), which after 6 Olympiads as a players, will be a first for me. I am off to the 2018 Chess Olympiad in a few hours. I'll be travelling for about 30 hours before I get to Tbilisi, before heading to Batumi the following days. Updates during this time depend on wifi access at various airports, otherwise I will post in a day or two. Sometimes when you turn up for a tournament game, nothing seems to go right. This seemed to be a problem for one of my opponents at the 2004 Olympiad in Majorca. I'm not sure if he was a victim of the late nights that usually effect players on the lower boards (including myself), but he did miss one of the oldest tricks in the book with 7.Nxe5 After that his position kept getting worse and worse, and by the time I captured the knight on e5 he seemed almost glad to resign. "Just not my day" he said as he offered his hand. While previous years my trip to the Chess Olympiad often saw me extend my stay overseas by a week or two, this time it is straight there and straight back. Otherwise I would have been tempted to do a bit of walking in the English countryside, visiting the aptly named Chess Valley. Named after the River Chess, there are plenty of walks to be had. One that I came across starts at The Cricketers in Sarratt and is a circular route of around 8km. From the description it covers a lot of farmland and wooded areas, so based on previous experience of walking in the UK, a sturdy pair of boots is a necessity. There has been a big sporting controversy in Adelaide when one team in the Preliminary Final of the local Australian Rules Football competition started the 4th quarter with an extra player (18 players is the usual number, but they had 19 on the field). During the period they had the extra player, they scored 8 points, and eventually won the game by a margin of 5 points. After a hearing the result was allowed to stand, although they have penalised in other ways. Interestingly, if they were using the Laws of Chess during the game, they may have been able to resolve it differently. Once the irregularity was observed, the umpires could have simply removed the points scored, reset the clock to the start of the quarter, and began again. Indeed this approach may have been better than what was decided (which I disagree with), or simply awarding the game to the opposition by removing the 8 points in question (which I thought should have been the decision). Anyway, here is a related puzzle, concerning an extra man on the field. It is White to play and Mate in 1 move. The 2018 Olympiad is now a little under a week away. I am assuming that the team lists have now been finalised, with the might PNG team just breaking into the top 150. Australia is seeded 41st, New Zealand 78th, while Palau, Guam and Nauru are just below PNG. Working out likely first round opponents is still a bit tricky, as despite the entry list containing 185 teams, not all of them will make it to the first round (if at all). PNG is likely to play a team seed in the mid 50's (eg Estonia) while Australia could be up against a team seed in the 130's. The opening ceremony is on Sunday 23rd, with round 1 on the 24th at 3pm local time (which is 9pm Canberra time). The event has one rest day (after round 5) with round 11 on the 5th October. If you are a chess problem composer, being able to checkmate in more than one way is an undesirable outcome. But if you are a player, the having multiple mating moves is usually a good thing. In one of my game from Street Chess today I ended up in such a situation, after my opponent allowed his King to be dragged out into the centre of the board. From move 18 almost every move of mine was met with "Oh No!" from my opponent, and at the end I had the choice of checkmating with my Queen, Rook, Knight or Pawn. After a brief discussion with my opponent ("What do you wish to be mated with?") I went for the minimalist approach and mated with the b pawn. The election for a new FIDE President is coming up very soon, and the current FIDE Vice President Georgios Makropoulos is taking no chances in trying to make sure he wins. He has referred one of his rivals, Arkady Dvorkovich to the FIDE Ethics Commission over a sponsorship package to the Serbian Chess Federation. The complaint asks that Dvorkovich be banned from any political activity with FIDE for 8 years. Using the FIDE ElectoralEthics Commission has been one of Makropoulos's 'goto' moves in recent years. Gary Kasparov and Ignatius Leong copped a ban after the last election in 2014, with Kirsan Ilyumzhinov also receiving a sanction in the past year. The Ethics Commission has pretty wide latitude in deciding which cases are considered 'receivable' but I'm sure this one will be. In the Oceania region there is also plenty of goings on that the Ethics Commission could be looking at instead. The Solomon Islands Chess Federation have gone public with an explanation about why their delegate is someone who they have never met, lives in Greece, and has connections with the current FIDE administration. It was in return for a 3000 euro payment for chess equipment, although the money has not been spent as yet (I have a copy of the bank transfer). And just as seriously, one of the candidates for Oceania Zone President was using an endorsement letter from a Federation that was composed by himself, with a signature from the federation president that was used without permission (It seems to have been cut and pasted from previous correspondence). If the Makro campaign was serious about the integrity of the election process they should set a better example by referring one of their own to Ethics instead. The other night I saw a game between a newcomer to my local chess club, and a more experienced player. I noted that the newcomer had two fewer minor pieces than his opponent and simply assumed that they had been lost. Returning to view the game a number of moves later I saw that more material was about to be lost, but then noticed something strange. The more experienced player was missing a queen, and I realised that they had probably been missing a queen for a quite a while. My assumption about the loss of two pieces had in fact been wrong, and in fact the two pieces had come off the board in return for the queen. Sadly for the newcomer, his opponent knuckled down to the task, coordinated his remaining pieces and went on to win. A famous example of my mistake occurred in a game between Fischer and Gligoric in the 1966 Olympiad. Fischer had surprised the world with his revival of the Exchange Lopez, and he used it to beat Gligoric in 25 moves. Gligoric was down two pieces by move 22 but played on just long enough to confuse a few passing GM's who thought that in return for the two pieces, Gligoric had surely pocketed a rook! For Canberra players looking to either boost their FIDE (International) rating, or even get one for the first time, the Belconnen Chess Club is organising the only FIDE Rated club event in Canberra this year. It starts tonight (11 September) at the Belconnen Chess Club, 170 Hayden Drive, Belconnen. It will be a 7 round swiss (1 round per week), with a time limit of 60 minutes + 30 seconds added per move. Under FIDE rating regulations games between players rated below 2200 can be rated, although games involving at least one player rated above 2200 will not (they will still be rated on the Australian rating list). Why do we blunder at chess? "Because we can" is one possible answer. "No idea" is probably just as good. But my favourite reason is the streakers defence. "It was a good idea at the time." Here is a game from a Correspondence event I am currently directing. The reason I picked this game is that it is played between two reasonably strong players, and as a CC game, you would think the chances of an outright mistake are quite low. 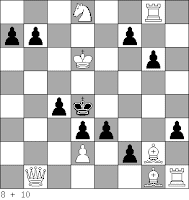 But on move 25 Black spots what looks like a good move, only to have it all go wrong two moves later. 27.Qd3 looked pretty obvious, so I'm not sure what Black was thinking. Maybe he saw a defence which had a flaw in it, or just decided that winning the exchange was good enough. It turns out it wasn't. Today saw my biannual pilgrimage to the Canberra Lifeline Bookfair, a trip that involved more walking than normal. For once Miles Patterson and myself seemed to be the first to the chess section, so we had the pick of the collection. I'm pleased to say that there were plenty of good chess books on offer, and while there were a number I already owned, I still grabbed about half a dozen. One of my more curious finds was a signed copy of "A Guide to Attacking Chess" by IM Gary Lane. However, it wasn't actually signed by Gary, but instead contained the signatures of GM Darryl Johansen and GM Ian Rogers. One other book a picked up was "Secrets of the Russian Chess Masters". Early in it is a study from 1933 by Mark Liburkin, as shown in the diagram. It is White to play and win. Obviously the first issue is to deal with the threat of 1 ... c1=Q# or 1 ... Be5, with the threat of discovered mate. Once you have done that, then it becomes a battle between White and the Black bishop. There are a number of subtle touches all the way through, although sadly, there may be a tougher line at the end that the composer may have originally missed. If you find it too hard to solve, feeding it into any strong engine should give you enough of a solution to see what the composer was trying to achieve. What is the minimal amount of knowledge needed for a viable opening repertoire? By that I mean, what is the minimal number of openings you need to know to deal with 95% of situations? Obviously an opening like 1.e4 is out, as Black has too many replies. 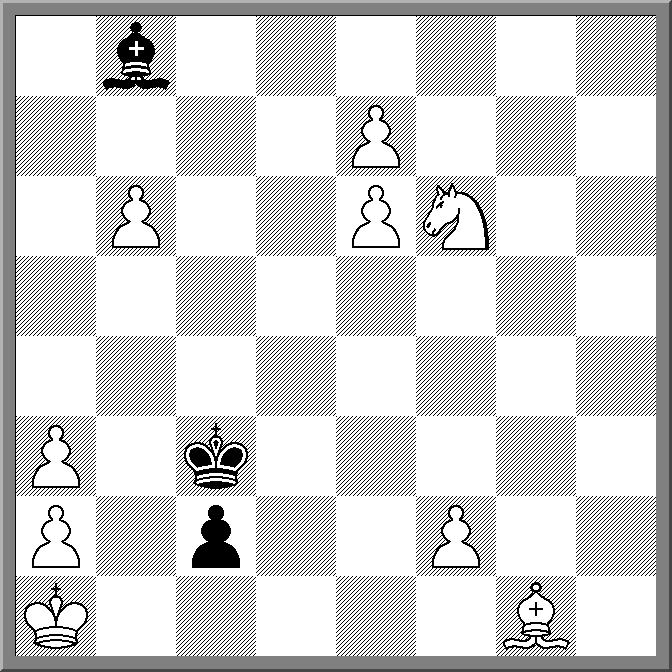 1.f4 springs to mind, as Black usually plays 1 ... d5 or 1 ... e5! ?, and so learning systems against this are not too difficult. Related to this is even 1.b3 although Black has a little more variety. 1.b4 is another choice, as Black is probably not expecting it, and will react with obvious moves. With the Black pieces, Pirc/Kings Indian may work against both 1.e4 and 1.d4, but White has a lot of lines against both. Playing 1 ... c6 against anything might also be possible (Slav/Caro Kann). Of course you could take the Basman route and simply play 1. 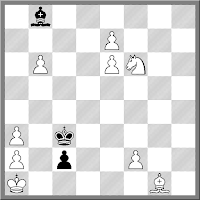 ... a6 and 2 ... h6 against everything and decide that the middlegame has started on move 3! This evening I won a fairly good game at my local club, utilising the Schliemann Defence to the Ruy Lopez. To be fair, my opponent played fairly solidly throughout, but played one poor move that saw his position fall to pieces. Rather than show you that game, I instead have chosen an interesting game between Rashid Nehzmetdinov and David Bronstein. Even though Nehzmetdinov also chose the solid 4.d3 variation, he eventually whipped up a kingside attack by sacrificing his h pawn, and after Bronstein missed the strength of Bxh6 it was all over. A few days back there was some controversy at the US Open (Tennis, not chess), when the chair umpire came down to give Nick Kyrgios a pep talk during his 2nd round match. Kyrgios picked up his form, and went on to win the match. This sparked a discussion about whether the umpire's actions affected the outcome of the match, and whether it was the correct thing to do. This question occasionally pops up in chess events as well, when arbiters are called upon to help players. At junior events this can often go as far as calming down upset children when they blunder, but it also happens in open events. The most common case is making sure players follow the rules. An example from a number of years ago was when a player asked me what the correct procedure was for claiming a draw by repetition. If I refused to answer there was a chance that he would do it wrong and be penalised. If I did answer I could be helping him save a game that he otherwise may lose. So essentially my decision would affect the result one way or another. I did explain the rules to the player (which the opponent had no problem with) and if I recall correctly, he realised his draw claim would be invalid under the circumstances, and played a move as normal. Since then the Laws of Chess have been updated to deal with this situation, in that players are now entitles to ask the arbiter to explain any rule (and I used this example in helping draft the new rule). This is probably as far as I would go though. Certainly reminding a player to press their clock is a step to far, but there is still a bit of a grey area. If you saw a player touch one piece but then move another, would you wait until they pressed their clock to intervene, or say something straight away?